A flat, toned stomach – it’s one of the most sought-after body features – and one of the least attainable. There are many factors that can make it difficult to lose fat or gain muscle definition on the stomach, like poor skin laxity, stubborn fat and muscle weakness; but the truth is, it is a notoriously difficult area to maintain either through diet or exercise. 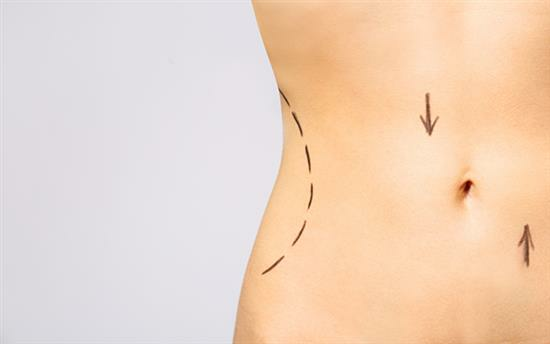 Many patients of cosmetic surgery would like to target their stomachs – in fact, in the last 6 months, abdominoplasty surgery (a tummy tuck) has been the fastest growing surgical procedure according to a Whatclinic.com survey. Whether they’ve got a small stubborn paunch of fat that just won’t disappear or a larger problem area with loose skin or stretch marks, patients consistently look to cosmetic surgery to elicit the results they’re looking for. But surgery is advanced and widely encompassing, and it can be difficult to understand what treatment you are most suited to. For most people who are looking for the long-term and effective results of a surgical procedure, it will either be liposuction or an abdominoplasty. But which is right for you? Liposuction is often considered less ‘invasive’ of the two procedures, and admittedly it does usually warrant shorter recovery times and fewer potential risks. In addition to a traditional liposuction system, Mr. Chana harnesses the power of VASER liposuction, an advanced, energy powered liposuction system. In general, you will be better suited to liposuction than abdominoplasty if you have good skin laxity, which means it will ‘bounce’ back retract after fat has been removed from the body. If you have stretch marks, loose skin folds or an overhang of skin (or an apron) then liposuction is not suitable since the loose skin will need to be removed and tightened surgically. Another factor not addressed by liposuction is the presence of loose abdominal wall muscles which are often stretched during pregnancy and cause protrusion of the abdomen. This is due to the fact that the join between the muscles on the left and right-hand side of the abdomen gets stretched during pregnancy and can cause a bulge which is just short of being a hernia. This can be repaired during an abdominoplasty. In short, then, liposuction is preferable for individuals in whom the good quality skin will respond best to it. If you have not had children, if your skin is in good condition, if you don’t have many stretch marks or if you do not have any noticeable muscle weakness around your abdominals, these are all indications that you might be best suited to liposuction. Tummy Tuck (Abdominoplasty) surgery is considered the more invasive of the two surgeries, but when performed by an experienced cosmetic surgeon, it is safe, relatively comfortable and extremely effective. During a tummy tuck, not just fat but excess skin is removed from the lower abdominal area. For this reason, scarring is more of an issue than it is with liposuction, but for people with a lot of loose skin, scarring is usually seen as a ‘fair trade’ since the advantages of removing loose skin far outweighs the presence of a scar which is hidden in the bikini line. The muscles are usually repaired at the same time and this contributes hugely to achieving a flatter profile. It is common to carry out some minor liposuction at the same time to further refine the result and this can be targeted to improve the flank area the waistline. There is a procedure called a mini-abdominoplasty where only a small amount of skin is removed from just above the pubic area. This is only suitable for individuals with a small amount of skin laxity in the lower abdomen. The decision between a full abdominoplasty and a mini-abdominoplasty can only be determined during an examination at consultation. In general, you will be better suited to a tummy tuck than liposuction if you are an older patient or a woman who has had children. If the skin is loose or you have a lot of stretch marks with loose muscles, then these are also external signs that you might be better suited to an abdominoplasty procedure. After reading this post, you might have a better idea about which procedure you are most suited to – and as there are clearly identifiable traits that render patients more suitable for one than the other, there’s a good chance you will have a more accurate idea of what might be suitable. However, it is vitally important that you seek a thorough consultation with an experienced plastic surgeon like Mr. Chana before you undergo cosmetic surgery of any kind. During your consultation, Mr. Chana will be able to assess your individual circumstances and expectations before arriving at a decision based on experience. Your consultation, too, is an excellent opportunity for you to talk to Mr. Chana about any concerns you may have about the surgery, and ask any questions you might have. Not everyone is a suitable candidate for surgery, whether this is for physical, psychological or medical reasons – and this is something that Mr. Chana will consider during your consultation, too.